For starters, let me be clear that I do not blame the post office. To their credit, the post office offers a wide variety of stamps. To the husband’s credit, he has a wide variety of interests, stamps being among them. Those two things appear a good match on the surface, but there are two underlying problems. First, when you buy stamps to use, you must use them. Secondly, there are few things we send by snail mail today. The last time either of us mailed a hand-written personal letter was probably 20 years ago. With the exception of our utilitities, we pay most everything online. Today, the items we most often send by mail are sympathy notes and get well cards. Those are the last two forms of human communication yet to be hijacked by the digital age. “Aren’t these cool?” the husband asks, flashing a sheet of Jimi Hendrix stamps. Four stamps with an image of Jimi Hendrix with a background of swirling colors come together on a quadrant at the center of the sheet to make a psychedelic image. Four quadrants then come together to form an even bigger psychedelic image. Yes, they are cool. And I could be overthinking this, but when you send a note expressing sympathy on the heartbreaking loss of someone’s mother or father, doesn’t it seem bizarre to attach a stamp bearing the likeness of the guitar hero of the ‘60s noted for amazing talent and heavy drug use? Fortunately, the Purple Haze stamps are not my only option. 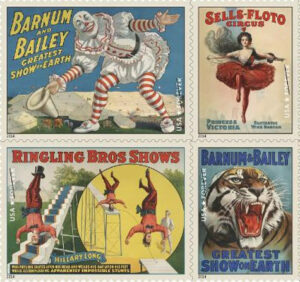 The husband also returned with vintage Barnum and Bailey Circus Poster stamps as well. “Didn’t they have any flags or flowers?” I ask. Because the husband of many interests also has interests in art and design and history, these stamps are a win-win—artfully designed and commemorating historic events. 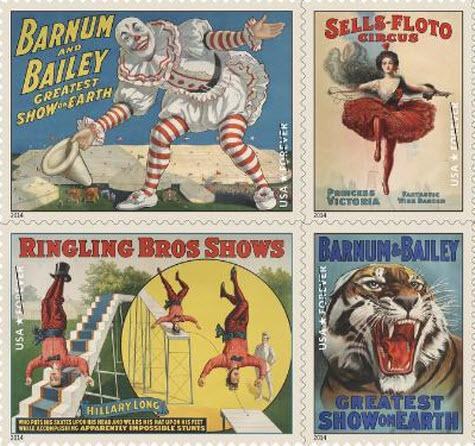 Nonetheless, the circus stamps are only marginally more appropriate for notes and cards to the downcast. I’m torn. Do I use the stamp of the tightrope walker or the stamp with the man in red standing on his head at the bottom of a flight of stairs with his top hat on his feet? On second thought, I may go with the clown in the red and white striped tights taking a bow. I sent out another sympathy card last week. I went with an old Christmas stamp I found in the desk drawer. The husband noted that since these new stamps are so great, we should use them selectively. Done. 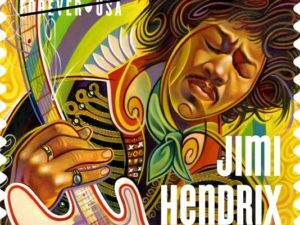 A Jimi Hendrix just went on a magazine renewal and circus stamps on a couple of birthday cards, but we still have a lot left. I hope the power company appreciates them.